The reason Einstein was on SGT. PEP. cover was because he was the most brilliant man of the 20th century and everyone knew it too!!!! The Beatles had searched for meaning in so many areas of life up until this point and had not found it. Maybe they had missed out by not concentrating more on their education? This is “Picasso’s Last Words(Drink To Me)”, from the album, “Band On The Run”, by Paul McCartney And Wings in 1973. Whole Lotta Shakin’ Goin’ On a song recorded during the Get Back sessions on January 3, 1969. Today 12-27 in 1958: While attending a class at the Liverpool College of Art, John Lennon meets student Cynthia Powell, later to become his first wife. The highest level of education any of the Beatles experienced was a short time in art college by John Lennon in the late 1950’s. Evidently all four of the Beatles did not get good grades in school but John did advance to this distinguished art school. 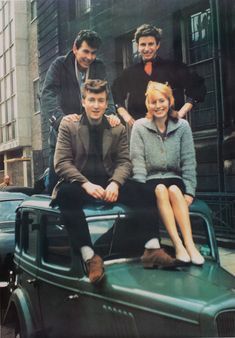 Among its former students are John Lennon, Cynthia Lennon, Maurice Cockrill, Ray Walker (artist), Stuart Sutcliffe, Margaret Chapman and Bill Harry. In 1975, Clive Langer, Steve Allen, Tim Whittaker, Sam Davis, Steve Lindsey, John Wood and Roy Holt a mix of Fine Art students and tutors at the college founded seminal ‘art rock’ band Deaf School and went on to sign a record deal with Warner Bros Records US after being ‘discovered’ by former Beatles publicist and head of Warner Bros UK at the time Derek Taylor. Deaf School are acknowledged as catalysts of the post Beatles musical revival in the city. Below is a portion of the article, “John Lennon, the boy we knew,” and it discusses the experience that John Lennon had at art college. A close friend of John Lennon’s from Liverpool art college, BILL HARRY launched Mersey Beat at college, a publication about the Liverpool music scene which was instrumental in the Beatles’ success. He has written several books about the band. He was a bit aggressive at first. If he found he could browbeat you then you were under his thumb. He used to treat Stuart [Sutcliffe] really badly at times, humiliate him in front of people. At college girls would be chatting in the corridor, and when John walked by they’d shut up and shiver. He had a bit of an acid tongue. But if you stood up to him he liked that. I introduced my mates Stuart and Rod Murray to John, and we used to go to Ye Cracke, the art school pub in Rice Street. The four of us decided to call ourselves the Dissenters and made a vow to make Liverpool famous: John with his music, Stuart and Rod with their painting, and me with my writing. 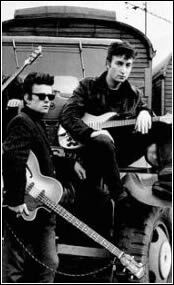 I coined the phrase “Mersey Beat”, launched a newspaper of that name and got John to write the story of the Beatles for the first issue. “On the Dubious Origins of Beatles, Translated from the John Lennon” was a wacky thing about how a man came down on a flaming pie and gave them the name. John was so delighted I’d published it that he brought me a bundle of 250 stories, poems and drawings he’d done, so I began publishing them. One of his favourite writers was Richmal Crompton who did the Just William books, and he was into the radio show The Goons. But his favorite book was Alice’s Adventures in Wonderland, he loved Lewis Carroll. One time Margaret Duxbury, who shared the flat with Stuart and John at Gambier Terrace, fell asleep so John made us get potatoes, put matchsticks in them and dangle them above her so when she woke up she’d think there were spiders on her. He’d do things like that all the time. I loved John’s art because it reminded me of Steinberg, the American artist. He had a great fluidity of line with his cartoons and things. But he was such a rebel. We’d get commissions at college, the teacher would say “I want you to paint the docks”, and when he collected the work and ordered it by merit, John’s would be last because while everyone would depict cranes and dockers and things he’d just draw a foot. Or instead of drawing the life model, he’d draw her watch. Aunt Mimi said she always remembered me because I was the first person to call John a genius. His mind was different. He always tried to stretch himself, often in mischievous ways. It seems the members of the Beatles were asking much the same back in 1950s Liverpool. According to their biographer Bob Spitz, John Lennon, Paul McCartney, George Harrison, and Ringo Starr were mostly poor and uneducated. 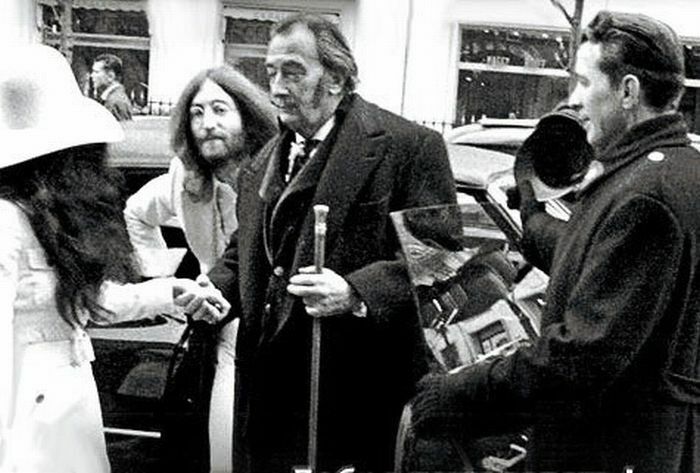 Lennon was the only band member to grow up “solidly middle class,” while Spitz described Starr’s living conditions during childhood as “Dickensian.” Whatever wealth gap existed in England during the ‘50s and early ‘60s, the future Beatles were all to varying degrees on the wrong end of it. Why did Albert Einstein get chosen to be on the cover of SGT. PEPPER’S? The reason was because he was the most brilliant man of the 20th century and everyone knew it too!!!! The Beatles had searched for meaning in so many areas of life up until this point and had not found it. Maybe they had missed out by not concentrating more on their education? 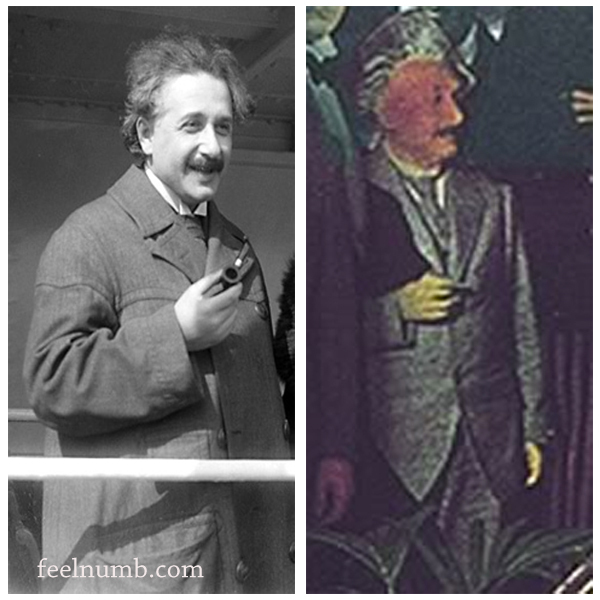 Albert Einstein – His cut-out was mostly obscured in the final photo by John Lennon as only his hair is visible. Einstein can only be seen in the out-take photos. Albert Einstein talks about theory of relativity, graphics show equation E = MC squared (E=MC2); explains the theory of relativity. Einstein smoking pipe, reading. Looking at formula. Einstein meets with Professor Solard. Letter being typed in typewriter. Einstein with scientists in office, read proclamation for peaceful use of atomic power. Einstein says “I agree”. Young Albert Einstein at party (VERY NICE). Camera pans across men and women at a testimonial dinner, including Albert Einstein (1920s). Great shots of black tie affair with dignitaries and the rich enjoying a swell lavish time. (Very 19210-20s Germany) Shots of the following men at the dinner: Tristan Bernard, Max Von Schillings, Albert Einstein, Helmut Gerlach. Albert Einstein delivers a speech (pre-WWII), mentioning his gratitude at being “a man, a European and a Jew” and the importance of freedom. Nice long speech clip citing other men of science. CU Albert Einstein speaks of danger of nuclear suicide. Einstein (CU talking, NO AUDIO). David Ben-Gurion with Albert Einstein. The Beatles in a press conference after their Return from the USA. I can’t think of another person in the Bible that comes close to the brilliance of Albert Einstein except possibly King Solomon. 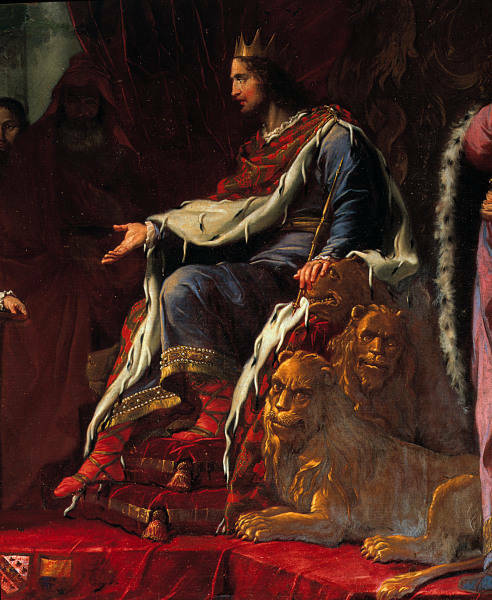 HOW BRILLIANT WAS KING SOLOMON? 29-34 God gave Solomon wisdom—the deepest of understanding and the largest of hearts. There was nothing beyond him, nothing he couldn’t handle. Solomon’s wisdom outclassed the vaunted wisdom of wise men of the East, outshone the famous wisdom of Egypt. He was wiser than anyone—wiser than Ethan the Ezrahite, wiser than Heman, wiser than Calcol and Darda the sons of Mahol. He became famous among all the surrounding nations. He created 3,000 proverbs; his songs added up to 1,005. He knew all about plants, from the huge cedar that grows in Lebanon to the tiny hyssop that grows in the cracks of a wall. He understood everything about animals and birds, reptiles and fish. Sent by kings from all over the earth who had heard of his reputation, people came from far and near to listen to the wisdom of Solomon. The Beatles were searching for meaning in life in what I call the 6 big L words just like King Solomon did in the Book of Ecclesiastes. He looked into LEARNING (1:12-18, 2:12-17), laughter, ladies, luxuries, and liquor (2:1-2, 8, 10, 11), and labor (2:4-6, 18-20). Clark says Einstein was “German by nationality, Jewish by origin”, but Einstein was first enrolled at Luitpold Gymnasium, a Catholic school. It appears that the Einstein family was Jewish by name only. At the age of sixteen, Einstein tried to get into the Swiss Federal Polytechnic School in Zurich, which would “qualify him for a post on the lowest rung of the professional teacher’s ladder.” After failing the entrance examination once, he was accepted and got his degree, but he could not find a post. He eventually got a job working in a patent office as a technical expert. When he was not working, he was writing papers on theoretical physics, and in 1905 he wrote three particularly brilliant papers. Schwinger says, “The year 1905 was a miraculous one for science. A totally unknown physicist produced not one but three revolutionary papers in physics that year.” One of those papers written in 1905 was “On the Electrodynamics of Moving Bodies”, in which Einstein presents the special theory of relativity. 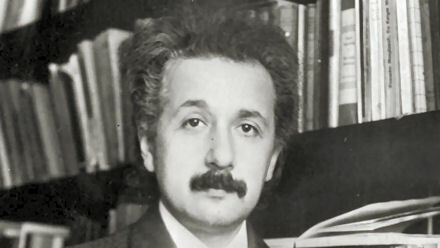 Einstein contributed to the sciences with his two major works on relativity: his special theory and his general theory. The special theory of relativity applied to uniform motion. His general theory of relativity was created to broaden his argument to include accelerated motion. He chose to focus on gravity because it is an important foundation of Newtonian physics. Could Einstein relativise the law of gravity? Yet people did interpret Einstein’s theory to be relativistic. Pearcey quotes Johnson, who says: “Mistakenly but perhaps inevitably, relativity became confused with relativism. . . . It formed a knife . . . to help cut society adrift from its traditional moorings in the faith and morals of Judeo-Christian culture.” Bernard Shaw cries out, “‘And now now what is left of it? The orbit of the electron obeys no law, it chooses one path and rejects another. . . . All is caprice, the calculable world has become incalculable.’” Unwittingly, the man who simply wanted “just to draw His lines after Him” helped to erase the lines and usher in postmodernism. Clark, Ronald. Einstein: The Life and Times. New York: World Publishing, 1971. Gamow, George. Thirty Years that Shook Physics. Garden City, NY: Doubleday & Co, 1966. Pearcey, Nancy and Charles Thaxton. The Soul of Science. Wheaton, IL: Crossway Books, 1994. Russell, Bertrand. The ABC of Relativity. New York: New American Library, 1958. 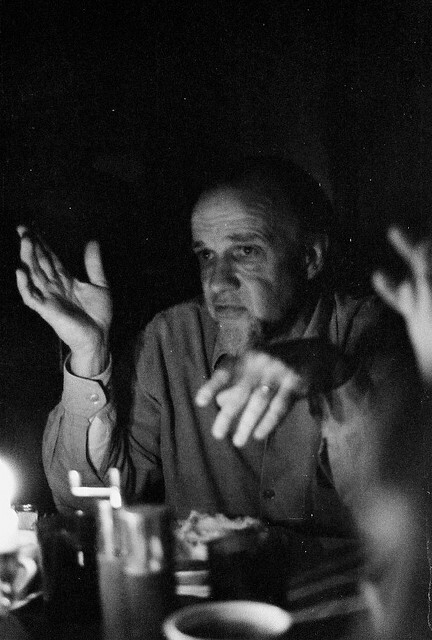 Schaeffer, Francis. How Should We Then Live? Old Tappan, NJ: Fleming H. Revell Company, 1976. Schwinger, Julian. Einstein’s Legacy. New York: Scientific American Books, 1986. This reality of which I speak falls into two parts: the fact that the universe truly exists and it has form, and then what I would call the “mannishness” of man--which is my own term for meaning that man is unique. People have certain qualities that must be explained. God has shut up all people to these things, and I always like to go back to the statement of Jean-Paul Sartre, though he had no answer for his own statement, and that is that the basic philosophic question is that something is there. Things do exist, and this demands an explanation for their existence. I would then go beyond Sartre’s statement to one by Albert Einstein. Einstein said that the most amazing thing about the universe is that we can know something truly about it. In other words, it has a form that is comprehensible, even though we cannot exhaust it. And then I would say beyond that–no matter what people say they are, they are what they are, that is, man is unique as made in the image of God. Any system of thought, to be taken seriously, has to at least try to explain these two great phenomena of the universe and man. In other words, we are talking about objective truth related to reality and not just something within our own heads. 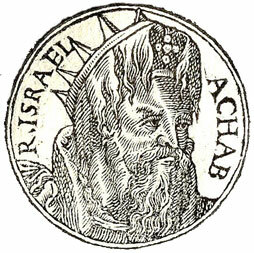 On the political front, Ahab had to contend with danger from the Aramacaus king of Syria who besieged Samaria, Ahab’s capital. Ben-hadad’s existence is attested by a stela (a column with writing on it) which has been discovered with his name written on it (Melquart Stela, Aleppo Museum, Syria). Again, a detail of history given in the Bible is shown to be correct. So they threw her down, and some of her blood spattered the wall and the horses as they trampled her underfoot. Jehu went in and ate and drank. “Take care of that cursed woman,” he said, “and bury her, for she was a king’s daughter.” But when they went out to bury her, they found nothing except her skull, her feet and her hands. They went back and told Jehu, who said, “This is the word of the LORD that he spoke through his servant Elijah the Tishbite: On the plot of ground at Jezreel dogs will devour Jezebel’s flesh” (2 Kgs 9:33–36). Seal of Jezebel with missing letters restored. The top of the seal has been damaged and it is in this area that Old Testament scholar Marjo Korpel suggests that there were originally two letters: alamed, meaning “(belonging) to” and an aleph, the first letter of Jezebel’s name. The restored inscription would then read “(belonging) to Jezebel.” The seal is scheduled to go on display at the Israel Museum in Jerusalem in 2010 when renovation work at the museum is completed. According to the Old Testament, King Ahab was the seventh king of the northern kingdom of Israel since Jeroboam I, and reigned during the 9th century B.C. In the Old Testament, Ahab, along with his wife, Jezebel, gets a rather negative portrayal for the various things that they did, such as the worship of Baal. It was on this hill that Ahab built his ‘ivory palace’. It is often pointed out that the existence of such a structure has been confirmed by archaeological evidence. However, it will be shown that this is not as straightforward as it seems, and that the phrase “Ivory Palace of King Ahab” is a rather problematic one. In 1932, the Joint Expedition to Samaria, located in present-day West Bank, discovered a large quantity of ivory objects and decorations (a total of 250 fragments were recorded) near the northern area of Samaria’s summit. This has led people, including the archaeologists, to believe that they have found King Ahab’s Ivory Palace. 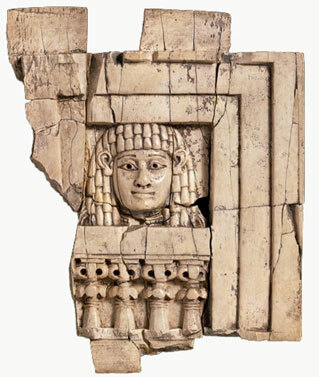 ‘The Woman at the Window’ – an ivory artifact from Samaria. Photo source. There are two problems with this interpretation. The first problem involves the question of what is meant by an ‘ivory palace’. One may envision an ivory palace to be a building somehow constructed literally from ivory (that’s what I’d imagine anyway). After all, if King Ahab were to be depicted as a really wealthy king, this would be a pretty good way to do so. However, these fragments were probably once attached to wooden furniture. The ivories from Fort Shalmaneser in Nimrud, Iraq, may be seen as parallels to those found in Samaria. Of course, one might argue that an ‘ivory palace’ was a building that had lots of ivory-decorated furniture, or ivory carvings, rather than a structure built of ivory. The bigger problem, however, is the fact that this structure was not even built by King Ahab. Based on the Kathleen Kenyon’s stratigraphic notes and summaries of the site, it seems that most of these ivory fragments date to the Hellenistic and Roman periods, several hundreds of years after the reign of King Ahab. Although a structure containing ivory fragments was discovered by archaeologists, it was not King Ahab’s Ivory Palace. So, why was it identified as such then? Perhaps it was only natural that the Biblical reference produced an impulse to date these ivory fragments to the reign of King Ahab. The area where the ivories were found was also initially thought to be part of the royal palace (the large “palace” discovered to its west by the Harvard team in 1908-1910 was relegated to the status of a ‘supplementary building’). This view, however, was withdrawn in 1938, when the archaeologists realized that the walls of this building actually comprised only a section of a section of a second, inner enclosure wall, and that they could not “make a room or pavilion out of them.” By then, the damage was already done, and the ‘Ivory Palace of King Ahab’ is still regarded by some as having basis in archaeology. If you think the score board is ‘Archaeology – 1, Bible – 0’, it isn’t quite as simple. Reliance on the Bible for the interpretation of archaeological evidence is very much like the reliance of any textual evidence. Although historical archaeology is said to be the “handmaiden to history”, it isn’t quite so. If you think archaeology’s here to support the textual evidence (of which history relies on), you’d better think again. I suppose, at the end of the day, one has to be critical of one’s sources, and not take the textual evidence at face value. Also, archaeologists ought to be careful with what they say, since there may be unforeseen repercussions, sometimes much worse than the misidentification of an ancient structure. 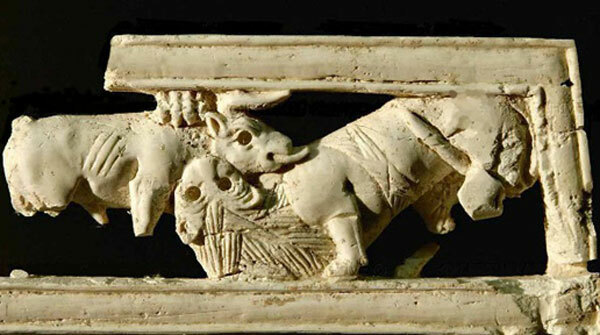 Featured image: An ivory plaque from Samaria depicting a lion attacking a bull. The lion symbolizes the sun, the bull the earth, the two creatures eternally warring for supremacy, with the lion better equipped to win. The plaque would have been attached to a screen or piece of furniture. Photo source. Herrmann, G. & Laidlaw, S., 2013. Ivories from Rooms SW11/12 and T10 Fort Shalmaneser. London: The British Institute for the Study of Iraq (London) (Gertrude Bell Memorial). Tappy, R. E., 2001. The archaeology of Israelite Samaria, Vol. II: The Eight Century BCE. Winona Lake, Indiana: Eisenbrauns. Archaeologists haven’t found only Assyrian evidence for the existence of King Ahab. While excavating Samaria they have found indications of another biblical description connected to Ahab’s reign—his house of ivory. The Bible says of Ahab, “Now the rest of the acts of Ahab, and all that he did, the ivory house which he built and all the cities that he built, are they not written in the book of the chronicles of the kings of Israel?” (2 Kings 22:39). Herschel Shanks, editor of Biblical Archaeology Review, writes: “An important ivory find from the Iron Age comes from Ahab’s capital in Samaria where over 500 ivory fragments were found … The Bible speaks of Ahab’s ‘house of ivory’ (1 Kings 22:39). Does this refer to the paneling of the walls or to the furnishings? To put the matter differently, did the ivory fragments found at Samaria decorate the walls of the building or the furniture? There is some evidence from Nimrud that a room in an Assyrian palace was, in fact, paneled with ivory veneer. Was this the case at Samaria? On the basis of the evidence at hand, it is difficult to tell. “Whether paneling for the wall or decoration for furniture, the houses of ivory—based on a highly sophisticated Phoenician ivory industry—were for the Hebrew prophets symbols of social oppression and injustice; the ‘ivory houses’ [mentioned in Amos 3.15] were also evidence of participation in the barbarous pagan practices and heathen worship of Phoenicia. Based on the archaeological evidence, the prophets knew what they were talking about” ( Biblical Archaeology Review,September-October 1985, p. 46). Lennon said the lyrics — in which he begs a new lover for tenderness after being wounded by the last girl — were “semiautobiographical, but not consciously.” On the surface, they had little to do with his life: He had been with his wife, Cynthia, for years, and their son, Julian, was almost a year old. But musically, it was one of Lennon’s cleverest songs to date: The harmonic tricks of its strummy, offbeat opening were miles beyond what other bands were doing at the time, and it was “dripping with chords,” as McCartney said. It also showcased some of the Beatles’ finest singing. Lennon and McCartney shared a single microphone for their Everly Brothers-like close harmonies. 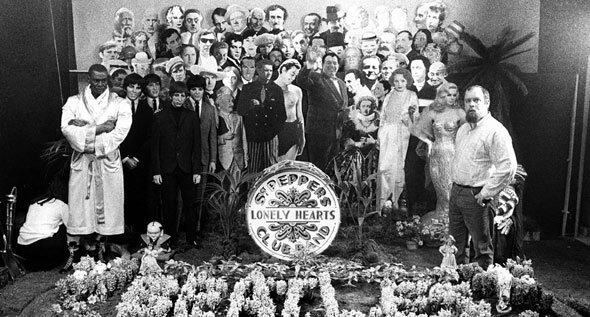 One paradox of Revolver: It marks the period when the Beatles began exploring the myriad creative possibilities of the recording studio, yet at the same time, it contains some of the most streamlined, straightforward pieces in the group’s catalog — among them McCartney’s radiantly soothing love song “Here, There and Everywhere.” McCartney wrote it at Lennon’s house in Weybridge while waiting for Lennon to wake up. 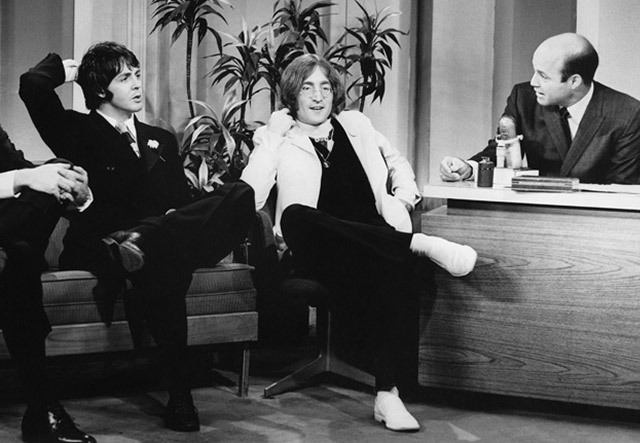 “I sat out by the pool on one of the sun chairs with my guitar and started strumming in E,” McCartney recalled. “And soon [I] had a few chords, and I think by the time he’d woken up, I had pretty much written the song, so we took it indoors and finished it up.” McCartney has cited the Beach Boys’ Pet Sounds as his primary influence for “Here, There and Everywhere.” McCartney had heard the album before it was released, at a listening party in London in May 1966, and was blown away. Since her husband John Lennon’s death thirty years ago, Yoko Ono has been vigilant with another passion that keeps her close to her soulmate: John’s art. In 1968, avant-garde artist Yoko Ono brought the new love of her life, Beatle John Lennon, to an art show she was a part of in Coventry, England. It was an experience that would come to perfectly symbolize the spiritual, romantic and artistic bond that would prosper for a dozen years until Lennon’s death in 1980. “I thought that John should come with me and do something at the show too,” Yoko told me the last time she came through town with John’s artwork. Yoko’s “In My Life” exhibit, presented by her and the Georgetown BID, with pieces for sale and on display, will be at 3307 M Steet in Georgetown May 7th through the 9th. During their time together, Yoko would prove to not only be the true love of Lennon’s life, but often his creative collaborator on everything from music to controversial protests to vanguard forms of media. But perhaps her most important influence on Lennon was her passionate encouragement of his growth as an artist, both when he was alive and posthumously. The road to acceptance for the iconic couple however, in art or anything else, was not an easy one. A profound chapter in Lennon’s art career are his “Real Love – The Drawings For Sean” pieces, which illustrate the intense love Lennon had for he and Ono’s son, Sean. Lennon’s difficult childhood fueled his deep desire to make life for Sean much different from the one he had. And if her husband were still living, what would he and Yoko be collaborating on these days? It’s lucky for the rest of us that no one took a real interest in John Lennon’s early art career. If someone had, the music world, even the world in general, might be different today. But during the time he was living as one of the world’s most famous musicians, John Lennon did manage to add “artist” to his genius’ resume, and today his work can be seen in museums and private collections worldwide. 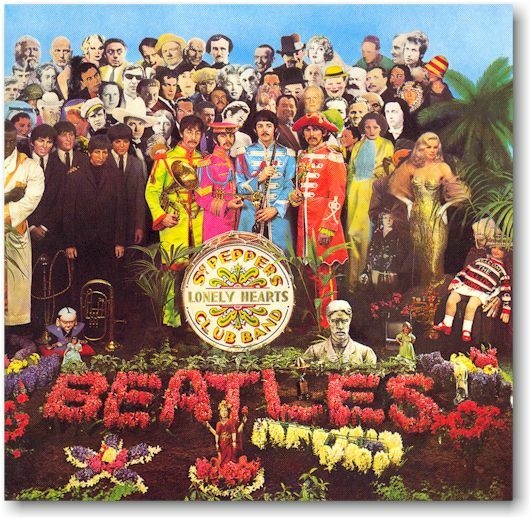 Lennon’s art interests began during his schoolboy days in Liverpool, even pre-dating his musical ones. “We have incredible drawings in the archives of John drawing Normans and Saxons, and it says ‘John Lennon, age nine and a half ’ or ‘John Lennon, age ten’ “, said Lynne Clifford, who worked with Yoko Ono for decades as director of Bag One Arts, Yoko’s company dedicated to preserving John’s art legacy. In the years after art school, Lennon joined a band, quit a band, and became a music legend. But he kept drawing, mostly working in quick sketching, and even going to Japan in 1977 to learn the difficult technique of Sumi ink drawing. Clifford says Lennon’s style has been characterized by art critics as “being situated between the worlds of free drawing, caricature and illustration, with a keen sense of observation, wit and irony.” But above all, it was simply another way Lennon communicated with people. Clifford feels that Yoko has been very brave to let the world see such intimate expressions of John’s love for his family.